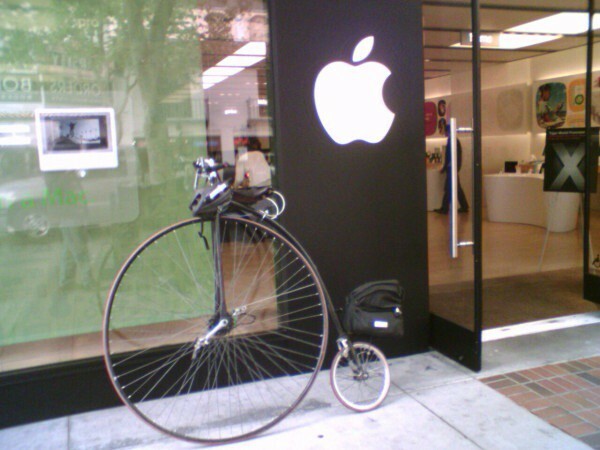 You know what a penny farthing is, whether from old-timey photographs or from your local insufferable hipster. But why on Earth is it shaped like that? These days, riding a bike with one giant wheel in front might be a purely aesthetic choice, but back in 1800s, the penny farthing was built for one thing: the pure adrenaline rush. The name "penny farthing" is actually a nickname for these strange-looking machines, and not a complimentary one. It refers to the largest and the smallest coins minted in England in the 1880s — just imagine a dime rolling after a 50-cent piece and you'll get the idea. It also didn't catch on until the bike was starting to go out of style. But in their heyday, a penny farthing would have simply been called a "high-wheeler" or more tellingly, an "ordinary". There's the most obvious difference between a penny farthing and a modern bike, and it makes it seem obvious why the giant wheels fell out of style. But there's another difference that it might take you a minute to notice. Unlike modern bikes, high-wheelers didn't have any gears or chains. In other words, the only way to make the wheel easier to turn with a pedal was to make it bigger. With one giant wheel, you go a lot farther on a single rotation of the pedals than you would otherwise. And for Victorian era speedsters, that was worth taking the occasional header. Still, there was definitely a need for a bike that wouldn't send riders flying head over handlebars at the slightest provocation. Some manufacturers attempted to improve on the penny farthing's design, but ultimately it was an entirely new type of bicycle that won out: the safety. That's basically the exact same bike that we've got today. Eventually, innovators would add multiple gears for added convenience, and later, other innovators would remove those gears for added hipsterdom. We have a tendency to think of penny farthings as being the oldest bikes out there, but the vehicles' history goes back much further. Kind of. In 1418, an Italian engineer named Giovanni Fontana built the first machine that had any connection to the modern bicycle, but it never really caught on. His invention had four wheels, not two, and it used gears connected via rope, not chain — and unfortunately, there aren't any surviving sketches of it. Leonardo Da Vinci also allegedly designed a bicycle that would have worked, but that claim is surrounded by controversy. Some believe it was not him but his student who made the drawing, and others think it was the presenter who "discovered" it in the 1960s. In any case, it would be about 400 years before another version of the bike would emerge. Squint, and it looks kind of familiar, but Karl Drais' draisine (also called a hobby horse or a dandy horse) had only a handlebar, two wheels, and a seat. That's right, no pedals. You had to Fred Flintstone this thing. But unlike Fontana's contraption, the draisine really took off, and other designs soon followed. Collectively known as "velocipedes" (or "bone shakers", for rather obvious reasons), they ranged from two-wheeled devices in wheelchair-esque configurations to tandem-tricycles with two seats side-by-side. But it was the high-wheeler that really caught on with the thrill-seeking set, and led to our modern bicycles thanks to how easy they were to crash. You know, we're starting to come around to the things. Now we just have to find a stovepipe-hat-shaped helmet.